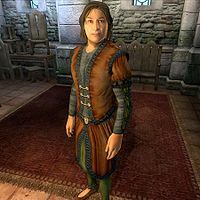 Tertullian Verus is an Imperial trader who lives and works with his two brothers Cicero and Sergius at Three Brothers Trade Goods in the Market District of the Imperial City. Tertullian sells general goods as well as the unique helmet Helm of the Deep Delver, which cannot be found anywhere else. Until you complete the Unfriendly Competition quest, Tertullian is one of the merchants complaining about Thoronir's low prices at the newly opened The Copious Coinpurse. While the name indicates that all three Verus brothers run the store, it's actually Tertullian and Sergius who provide the services. When they are not standing behind the counter together, they do their duties in shifts, making sure they both get a day off every now and then. They share a room in the private quarters above the store and sleep there every night between midnight and 6am. After waking up, they always eat breakfast with Cicero for two hours in the main trading room. Tertullian works every day of the week except Tirdas and Turdas and when the clock strikes 8am, he opens up the store for potential customers and works a solid twelve hours until 8pm. After closing up, he accompanies Sergio and Cicero to The Feed Bag for dinner until his bedtime at midnight. On Tirdas, he leaves the shop and Sergius, and heads to the Temple of the One for four hours of praying. After that, he heads to the Imperial City's popular Arboretum and strolls around there until his usual dinner time at 8pm. On Turdas, he skips the temple and spends the entire day at the Arboretum. Loredas evening sees him, Sergius, and fellow merchant Maro Rufus from The Best Defense praying in The Temple of the One between 8pm and midnight. Sundas is Sergius' day off and Tertullian is alone in the store all day. After that, he accompanies Cicero to the Talos Plaza District where he wanders around until midnight. His choice in clothing reflects his middle-class status: a russet felt outfit and matching shoes. He carries around the shop key, a spare pair of burgundy linens, and a fair amount of gold. He never greets you, but if you approach him before having met either of his two merchant colleagues, Claudette Perrick or Ogier Georick, he will not hesitate to complain about Thoronir: "Say, you look like someone that could help us out. Having a bit of trouble with another merchant in town who goes by the name Thoronir. He is dirty. Plain and simple. I don't trust him at all. Won't even come to merchant meetings and sets his prices so low, he undercuts everyone. If you want to give me a hand, go speak with Jensine at her Good as New Merchandise store. She can clue you in and maybe offer some coin." When you have successfully completed the quest, he will be more than happy: "The society triumphs once more! Thanks to you, of course." On the Imperial City, he will give you a piece of advice: "It's a beautiful city. But stay away from the Waterfront. It's not dangerous, but it's dirty, and the beggars are a nuisance." Esta página foi modificada pela última vez à(s) 06h47min de 25 de agosto de 2013.